TORONTO, ON – Loblaw Companies has announced that it is bringing one of Canada’s most recognized grocery brands into the beer market for the first time. 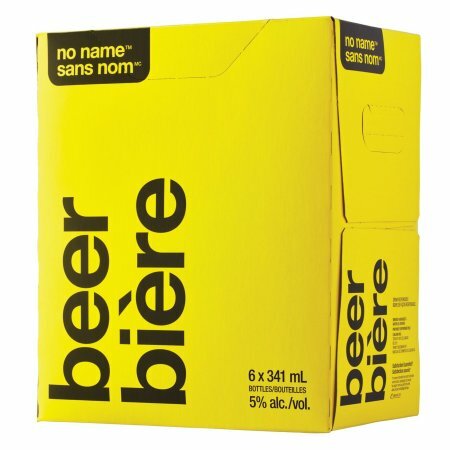 no name beer (5% abv) is a “characteristically Canadian-style lager” packaged in the classic yellow and black design used on the no name products that have been available at Loblaw’s stores and associated retailers for 40 years. no name beer is launching this month at LCBO stores in Ontario, where it will regularly retail for $10.45 per six-pack of 341 ml bottles. In keeping with the no name ethos of low prices, it will also be offered for the reduced “buck-a-beer” price of $6.60 ($6 plus 60 cents bottle deposit) on long weekends throughout the year, starting with the Family Day weekend on February 16th-18th.